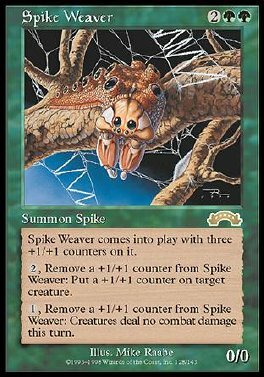 Spike Weaver comes into play with three +1/+1 counters on it. 2, Remove a +1/+1 counter from Spike Weaver: Put a +1/+1 counter on target creature. 1, Remove a +1/+1 counter from Spike Weaver: Prevent all combat damage that would be dealt this turn.